Today I find this story on my Twitter Feed. 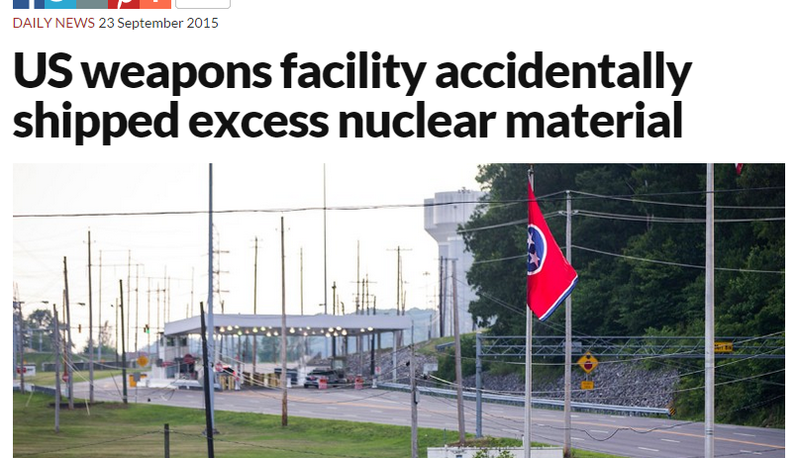 A government nuclear facility accidentally sent out some “excess” nuclear material. Whoops! The name of the facility rings a bell though. Haven’t I heard of government installation “Y-12” before? I’m pretty sure there’s been problems there before. Notice how we put some general associations at the bottom and use the text to highlight the realationship to the current page in a very direct way. I don’t really know where this new incident fits in, but I’d like to log it. So I go to the bottom of the Alarm Fatigue at Y-12 page and add another link. And that’s it, at least for now. It may be that later I come by and build a new wiki page that can replace that external link, or perhaps I create a new page on Y-12 in general and move this link over there. But what’s neat is watching your network of knowledge become more useful over time. Looking back at these pages I find the Normal Accident Theory page was added in November 2014. 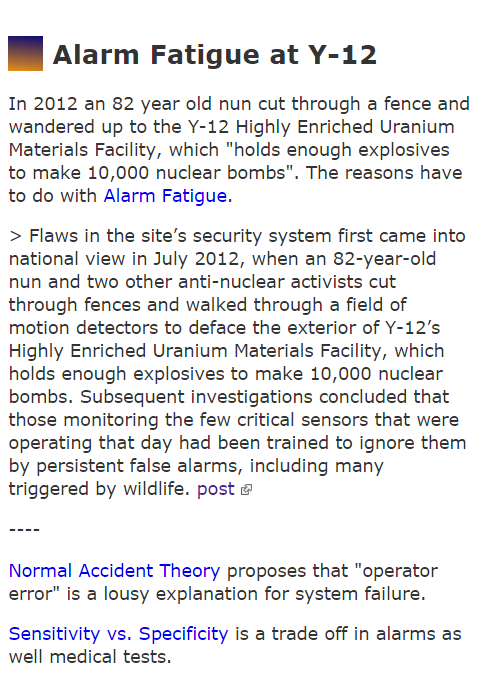 Alarm Fatigue (the general page) was added in January 2015, partially because of the way it resonated with and informed elements of Normal Accident Theory. 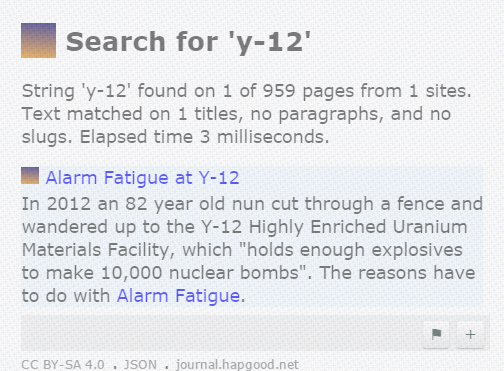 The Alarm Fatigue at Y-12 page was added based on something seen last month, which ended up being a perfect example of alarm fatigue. 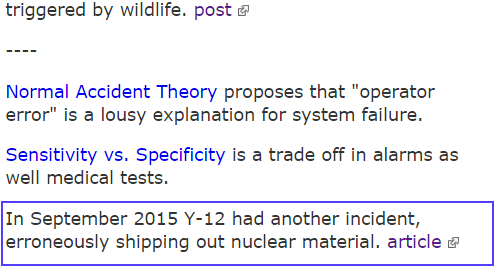 Now this link updates the page an suggests in time we might compile more information on Y-12, a seeming case study in how things go wrong. More amazingly. if you click through those links you’ll find we’re slowly developing a densely linked set of pages on the nature of error. Sensitivity vs. Specificity links to Safety and Reliability (which are opposed BTW) which links to Always-Never which links to One Point Safe which links to Command and Control. On a related vector, Alarm Fatigue deals with issues of signal-to-noise, bringing you to pages on Tea Kettle Tech (an Amber Case idea) and Techno-pastoralism. From there you can get to cybernetics and a dozen other things. I didn’t sit down one day and say let’s make a site on the nature of error and digital noise. This subject emerged organically, as new stuff came in. And therein lies a story. What I find my mind doing these days is letting go of the question “What do I think of that?” which is the primary question of the Self-Assertive Web. The Twitter response to nuclear error is “Nice! Keeping us safe!” or “Maybe Iran needs to inpect us. haha.” On the self-assertive web we don’t get past paragraph two without thinking “What is my take on this?” and constructing rhetoric in our head about it. And while that’s useful it dramatically limits what we can take away from new knowledge. With wiki journalling, on the other hand, my first question on seeing something is “What does that connect to?” Judgement comes, but is postponed while we make connections, link up examples, and find patterns. It’s the Integrative Web and I think we need more of it. Moreover, the thesis statement can actually be the enemy of critical enquiry because it straitjackets the writer into a line of argument that has to be defended to the death, blithely bulldozing – or simply ignoring – any tentative “yes, but…” that might get in the way. This is not a trivial issue. The tyranny of being forced to declare one’s position pervades our culture, from the school debating societies to our adversarial parliamentary system, where admitting that the opposing side may have a point is political anathema. This approach is potentially anti-intellectual – for when critical thinking is applied to most issues, it becomes apparent that there are multiple viable perspectives, which can both diverge and converge. This is my point about the Stream. We want to promote inquiry and multiple perspectives, yet we choose formats (blogging, forums, and the like) that favor personal rhetoric, argument, and expression. Luckily, there *is* a format that favors composing documents that present multiple perspectives, promotes not rushing to conclusions, and encourages students to embrace complexity instead of sweeping it under the rug to make a point. 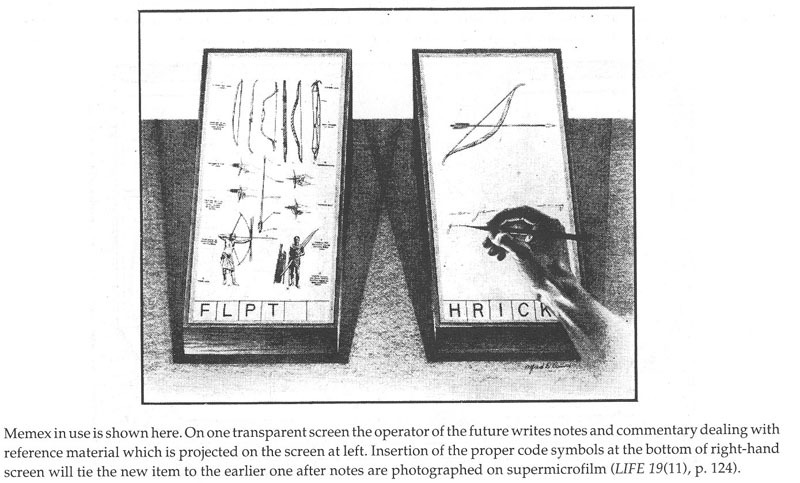 It’s called HYPERTEXT. We should use it.